Family History Gifts, Personalised Family History Reports and Hand-Bound Storybooks, Complete with your Family Tree. Our Family History Gifts include a Written Report of your Ancestry, Researched by a Professional Genealogist. 1. Family History Reports: Free with any Research Package. Our reports come in beautiful family history folders with gold lettering on the front. The folders come as part of any of our four family tree research packages at no extra cost. After picking your research package, your ancestry will be researched and recorded in a highly detailed and informative report. Reports contain a wealth of information with easy-to-read family tree charts also included. Our folders come in a variety of colours packed with many pages of family history research. Additionally, you can purchase personalised copies of our family history for anybody referenced in your family tree, such as your parents, siblings or children. At £75 each, they make unique family history gifts to pass down the generations. We can present the findings of your chosen family history package in a stunning hand-bound book. Complete with your name embossed in gold on the front cover and spine, these heirloom books contain everything within the standard report, plus even more! Our family history Storybooks come in many colours such as "This Is Your Life" red or antique brown. A family history Storybook is an ideal way to document your family tree which can be read by all the family. Our Storybooks certainly make ideal gifts for loved ones who are passionate about genealogy, and provide a thrilling experience for all the family to share! * The price of a Storybook is in addition to the cost of your chosen family history research package. We print our family trees on high quality paper. These are ready to frame and display in your home. One of our professional genealogists creates and designs our beautiful prints. These make unique gifts for special occasions. Or perhaps you'd simply like to treat yourself. The names of your direct ancestors will be on display alongside the dates and places of births, marriages and deaths. We can even include some additional information, such as the jobs that each ancestor did. Simply pick one of the family history research packages we offer and let a professional genealogist do the rest! * The price of a ready-to-frame family tree is in addition to the cost of your chosen genealogy research package. Alternatively, we may be able to produce a family tree from your own family history research. Personalised Family History Gifts for Ancestry Lovers. Looking for a unique family tree gift that's perfect for Christmas, a birthday or wedding anniversary? Our acclaimed professional genealogy company offers personalised family history gift certificates. 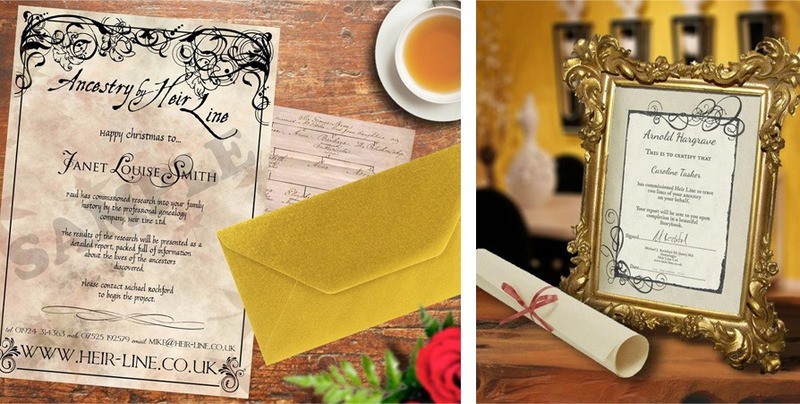 The certificate is sent with a beautiful golden envelope, for you to present to the recipient on the big day. Then, when they are ready to begin the project, they can contact our professional genealogist. We simply ask for some brief details about their family tree to get us started. We will additionally send updates as we go along, thus telling them some of the family history stories we have uncovered. Once the family history project is finished, we will then present their ancestry in a springback folder, a Storybook or a ready-to-frame family tree, as outlined above. Most families will certainly have an old box full of black & white and sepia family photographs that have been passed down through the generations. If you are looking for something spectacular to do with them, then send them to us! We can enhance and restore old photographs that have been slightly damaged, and provide you with a brand new image. We even painstakingly transform old black and white or sepia photographs into colour, as if by magic! Heir's Line's photographic restoration work is carried out by Caroline Rochford. Caroline, our head designer, is an extremely creative person with a first class degree in Graphic Arts & Design, and thus a superb eye for detail. You can post the original prints to us if you wish. However, we highly recommend sending high quality scans instead because you don't want to run the risk of losing or damaging any irreplaceable photographs in the post. Prices depend on your specific requirements, so please contact us to tell us about your project. • Your family history report begins with an introduction to your ancestry. This is followed by full family trees showing your direct ancestors and descendants. • Pedigree family tree charts show your direct ancestors and descendants. • A detailed overview of the lives of your ancestors explains where they lived, who the married, what they did for a living, etc. • Bite-sized family tree charts are also included. • An index shows the occupations your ancestors carried out. • Relationship paths explain how you’re related to everyone in your family tree. • An index shows the names of all the individuals within your family history. • An index of places reveals the towns, cities and villages that were important to your ancestors. • A timeline shows important dates and anniversaries in your ancestry. • Detailed biographical notes highlight some of the fascinating stories we discover about individual ancestors. Stylish pull-out family trees, showing your direct ancestors and descendants, feature at the front of your Storybook to help get you started! This briefly introduces your family history report. Paternal and/or maternal family trees show the names of your direct relations. This is a detailed explanation of who your direct and indirect ancestors were. Bite-size family tree charts are broken down into easy-to-digest family groups. What your ancestors did for a living will be included within the report. You will also receive an alphabetical list of all the job titles in your family history and the years in which your ancestors were working. Exact postal addresses of your ancestors (if these have been recorded) will be included. These illustrate how the recipient of the book is related to everybody in their family tree. If we discover any noteworthy life stories – such as old newspaper reports featuring your ancestors – these will be included in your family history Storybook. An index of all the people researched includes reference numbers so they can be followed throughout the report. This is an alphabetical list of the places that were important to your ancestors. Also included are the names of the churches where baptisms, marriages and burials took place (providing these records are available to us). 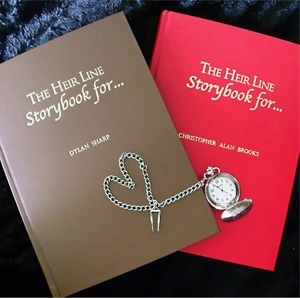 Towards the end of the Storybook is a list of chronological dates of notable events that occurred in your family history. If you are able to provide copies, we will print up to ten family photographs and include captions underneath explaining who is in each picture. If your ancestors were wealthy, they may have written Last Wills and Testaments. These are often fascinating documents, revealing all sorts of information about their lives, their closest relatives, and, of course, their most treasured possessions. Where did your ancestors live? It may be possible to trace historic maps showing the streets, the towns and cities where your ancestors once lived. Do these streets still exist, or has the landscape changed? Please note: wills and maps incur small additional charges in order for us to obtain copies of the documents. Ms. Maria Jones, International Opera Singer. Ms. Helen Talbot, Oulton, West Yorkshire. Mr. and Mrs. Jowett, North Yorkshire.